This exciting pattern is a complete campground in one envelope! Picnic table and benches, hammock, camping cot and tent. 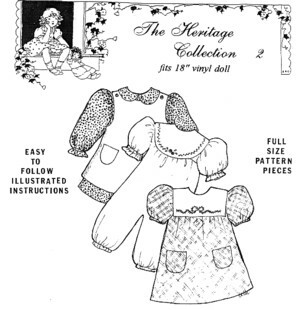 The large tent measures 29" x29"x 23" high, with plenty of room for lots of dolls! It has a screened window and a zippered screen door. An outer door unzips and ties back so dolly can easily get in and out of her new tent. It folds flat for easy storage and requires minimal sewing skills. Self-supporting, it requires no tent stakes and is perfect for indoor or outdoor use. The wooden picnic table uses prefinished lattice strips, so all you have to do is cut the pieces and hot glue them together! There is also an easy to build camping cot and hammock. 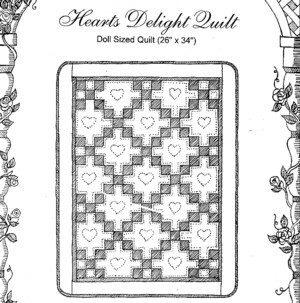 All necessary materials are inexpensive and easily obtained at your local building supply and sewing/crafts store. 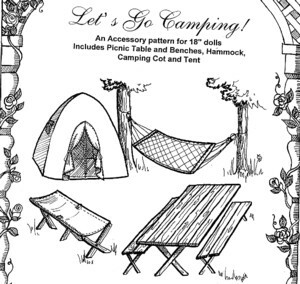 This camping ensemble will provide hours of imaginative play for your favorite doll lover! Great for Teddy Bears too!! !